Here’s a little foray into webcomics. I don’t expect many laughs, but I hope it makes a point. "I can't believe we skipped class to watch these dumb jocks play basketball!" People in traditional workplaces can sometimes feel like they’re owned by their employer. They have to follow their employer’s rules and structure their lives around their employer’s schedules and working hours. They rarely get to keep the fruit of their labors at work, aside from a largely fixed salary that doesn’t always accurately represent their value or contribution in the workplace. But at least they make a living and are free to use their skills, name, and image to do as they please in their free time. Well… unless they’re athletes and their workplace is one of the many NCAA member institutions scattered across the USA. NCAA athletes are not allowed to accept any amount money from coaches, agents, corporations, local businesses, or really anyone who they’ve met since they started getting recruited by college coaches. They are not allowed to profit off their own image; Anthony Davis may not sell a t-shirt with his distinctive eyebrow on it while others do. They are not allowed to get paid to play their sport, either in the present or in the past. In fact, a player who briefly accepts a stipend for playing as a 16 year-old can be banned from ever competing in the NCAA. In a country that prides itself on free enterprise and individuality, college athletes must sign away their right to earn money from their talents if they wish to compete for their school while pursuing an education. The men’s college basketball championship is the biggest source of income for the NCAA. If you watch it on TV, you’ll see propaganda commercials from the NCAA over and over that suggests their athletes are just ecstatic to have a chance to go to class and go on to become rocket scientists and brain surgeons. Other indoctrinating informative advertisements portray the NCAA as a benevolent, altruistic organization that funds and supports academic and athletic programs alike at institutions all over the country. The NCAA doesn’t miss an opportunity to insist that their athletes are amateurs and students above all and that their education and well-being is the NCAA’s top priority. "Hold on, you mean other sports leagues actually let their players make money?" That’s what they want you to think, but in reality the NCAA is full of hypocrisies and oppressive restrictions. “Amateur” athletes wear corporate logos for games, jerseys bearing players’ numbers are sold to their fans, and players’ images are used to promote televised events. The players themselves don’t – or should I say can’t – see one penny from all that profiteering. Lets be clear, college sports is a big business. College football programs in the six major conferences had over $1 billion in profit in 2010 – that’s profit not revenue. The NCAA’s recent deal for broadcast rights for the men’s basketball championship is worth $10.8 billion over 14 years. The NCAA isn’t really that interested in the educations or well-being of their student-athletes, either. For example, athletic scholarships, by rule, last a maximum of one year and do not renew unless the school and coach decides to renew them. If a student-athlete underperforms or gets injured, or if there’s simply a coaching change and the new coach wants a different kind of player, that player’s scholarship can be dropped on a whim. 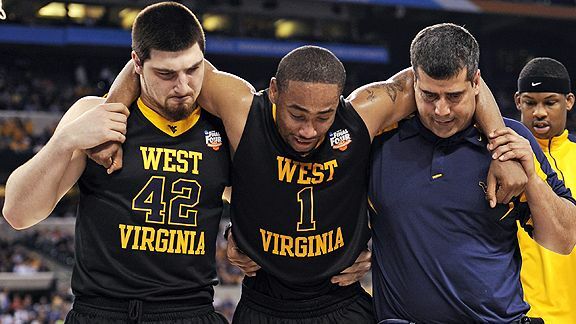 If a player suffers an injury so severe that he will never be able to compete on a Division I level again, his scholarship will be given to a player with healthy joints. If a player wants to transfer to another school to pursue a degree not offered at their current school, as Todd O’Brien at St. Joseph’s did, his coach can veto his transfer and deny him athletic scholarship without so much as an explanation why. "Sorry about your NBA career! We'll help carry you to the financial aid office... it looks like you'll need it now." I won’t go into detail about how unenforceable these NCAA regulations about amateurism and scholasticism are, but you won’t have to look hard to find stories about players getting paid under the table by big programs, agents cultivating relationships with college and high school players, and loopholes used to keep otherwise failing players academically eligible. Corruption, greed, and cheating are no strangers to the current environment of college athletics in spite of what the rulebook says. I believe there are good reasons why college athletes shouldn’t be paid and shouldn’t have professional contracts. Players negotiating contracts and transferring when they can get more money is not at all congruous with college life. I’m no expert on Title IX, but I think public institutions might be required to pay players in every sport if they pay anyone at all, which would not really be practical. Transitioning to such a system would require a huge overhaul of the college athletic system and, I believe, would distort much of what makes college sports so enjoyable and exciting. That’s not to say I’m against 18 and 19 year olds being able to play professionally (like they do in Europe or MLB minor leagues), I just don’t think it would work in anything like the college structure we’re used to. However, I think there’s a much fairer and more reasonable compromise to the exploitation of college athletes; players should own their own image and should be allowed to profit off their skills when they’re not playing for their school. This is the same right that other college students and other employees have. If you go to school on an academic scholarship, you won’t get your scholarship revoked for working a job or internship or starting a business if it doesn’t affect your grades. If you work as a software developer, you’re not allowed to sell the code you write for your employer, but you’re free to use your skills to profit off of side projects in your free time. Only college athletes are required to sign over their right to free enterprise if they want to pursue their athletic aspirations. Under this compromise, college basketball players would be allowed to accept payments from agents who are interested in representing them for their professional careers; sign endorsement deals and sell their name and image for use on jerseys, video games, and merchandise; and play their sport for money before they enroll in college or during the offseason. A system like this would allow many poor college athletes a chance to support themselves and their families while still in school and would bring some of the under-the-table dealings of the college game, like player-agent interactions, into the public domain. It would give players a chance to profit off of the huge business that they power, college sports. And it wouldn’t require colleges to pay a dime in salary to their athletes. "I'm sorry, I just can't see any reason to change the status quo." Of course, the NCAA wouldn’t want a system like this because it threatens their monopoly over young talent in the USA and could affect their bottom line. As it is now, if you want a jersey of your favorite college player, you get a jersey from his university with his number on it. If you want to see him compete, you have to buy a ticket to one of his college games. The system above would mean you could also buy an officially licensed jersey with that player’s name on it from a third party or get a ticket to see him play in an exhibition game or basketball camp in the offseason, with a cut of the proceeds going to the player himself. It’s competition, and the NCAA doesn’t want it. I don’t think this system would fundamentally change or diminish college sports. Some might claim that it would incentivize athletes to go to big-market schools or affect the way the elite, profiting athletes get treated compared to teammates who make little or no money. I would argue that top athletes already flock to big-market schools and that the megastars and future first-round picks already get treated differently given that they are likely future millionaires. I’d also argue that this compromise would reduce the incentive for paying players under the table because it gives elite players a way to get money through legitimate channels. In fact, you might see more players staying in school instead and preserving their academic eligibility instead of going pro because they’d have a chance to earn income in college. It’s not uncommon currently for college basketball players to leave school early even when their chances of getting drafted in the NBA are slim; it’s simply the only way they can support themselves and their families. Will the NCAA consider a change to their amateurism restrictions like the ones I’ve discussed here anytime soon? Not likely. Not while there’s no legitimate domestic competition for young football and basketball talent. Not while they continue to print money as fast as they can with the current structure. Not while casual fans continue to demonize college athletes found to accept money for playing their sport, but ignore those who get rich off those very same athletes. Maybe, the next time a player is retroactively declared ineligible due to amateurism issues and has to vacate his wins and individual awards, the entities that profited off of him while he was a student should have to “vacate” that money to charity. I am a huge fan of the University of Kentucky’s basketball team. The reason why is a bit of a long story (I haven’t stepped foot in the state of Kentucky – yet) but they’ve been my favorite college basketball team for over twelve years and the team I’ve followed closest in all of sports for over ten. Thanks to ESPN3 streaming all non-televised Kentucky games online these days, I’ve watched every game and almost every minute Kentucky has played for the last four seasons. I’ve gotten to know the players quite well. What follows is my take on the seven rotation players on Kentucky’s basketball team this season and their strengths, weaknesses, and outlooks. I won’t be referring to or analyzing any player stats, this will be strictly my own subjective, but (I hope) somewhat educated opinions. I’ve watched Darius Miller play basketball more than I’ve watched any other athlete in the world. Miller was a top 50 player coming out of high school and started his first three years. Now in his senior season, he has transitioned to a sixth man role which has earned him this year’s SEC sixth man award. Miller has undergone a major transformation while at Kentucky in terms of his mentality on the court and his role on the team. In his first two years, he was generally timid on offense and would frequently defer to teammates and pass up shots, earning himself the nickname “Disappearius Miller.” When Calipari took over after Miller’s freshman year, he would automatically send Miller to the bench whenever he passed up on a good scoring opportunity. However, Miller has matured immensely since then and has become one of Kentucky’s more reliable offensive weapons during rough patches and late in close games. This earned him the 2011 SEC Tournament MVP award on a team with no fewer than five future NBA players. “Disappearius Miller” has since been replaced with “Miller time” and “Millergasm” by the fans. Strengths: Miller is strong and physically mature, having packed on a lot of muscle in his years at Kentucky, with great size for a perimeter player. Miller possesses excellent athleticism and is capable of making highlight reel dunks and blocks. He is a solid ballhandler, having filled in for point guard duties several times throughout his time at Kentucky, and can be a playmaker in the halfcourt while not being particularly turnover prone. He is skilled at adapting his game and role to fit in with NBA-caliber teammates, having done so with three different sets of lottery picks over the last three years. He frequently exploits the talents and strengths of his teammates – I believe he comfortably leads the team in number of alleyoop passes to Jones/Davis or passes to an open Lamb/Wiltjer on the perimeter. Most of Miller’s points come from spot up threes and mid-range jumpers. He is a very good shooter when he has time to set up and displays good shot selection. He has very good touch around the basket, and is effective at getting into the paint and finishing with a floater off two feet. He is perhaps most efficient posting up smaller players, as he uses his size and strength to back them down and shoot over them at a high percentage. Weaknesses: Despite Miller’s aforementioned transformation, he could still stand to be more aggressive as he occasionally becomes passive and forgets to attack the basket. Even though he has excellent size and athleticism, Miller doesn’t stand out in rebounding as much as one might expect. His speed and quickness is not outstanding, limiting him somewhat in defense and getting past defenders as well as in full-speed transition. While he is a good jumpshooter, he could still stand to improve in that area if he wants to stand out at the next level and considering how many of his field goal attempts are jumpshots. Outlook: Miller hasn’t received an enormous amount of attention from the NBA as he’s been constantly overshadowed by lottery pick teammates. He is currently projected as a second round pick in most mock drafts, but I expect him to go higher than that and believe he can have a long career in the NBA. Working in Miller’s favor are prototypical size, strength, and athleticism for an NBA player. Miller is a highly adaptable player, seamlessly transitioning into whatever role the team needs from him, fitting in with new teammates, and having no issues with coming off the bench. I expect him to fulfill the same kind of role in the NBA that he’s fulfilled for Kentucky for the last three seasons. Wiltjer is a unique player unlike those Calipari has coached in the past. He is primarily a three point shooter and finesse player. Currently, Wiltjer is useful only as a spot up shooter, a big body on defense, or when mismatched against small defenders in the post. Strengths: Wiltjer’s outside shot is excellent. Reports from practice are that he’s one of the best shooters Calipari has ever seen. He has nice touch in the paint and smooth post moves when the defense allows him to get his shot off. Defensively, he’s been a pleasant surprise in the post. He displays an excellent understanding of positioning and help defense, smothering opposing post players with double teams and rotating fluidly. His size allows him to contest shots well and block opposing players occasionally, and he plays smart without fouling often. He boxes out well and gets his share of defensive rebounds. Weaknesses: Wiltjer is currently quite soft and weak with the ball, which greatly limits the ways he can contribute on offense. While Wiltjer occasionally shows good dribbling and crafty passing skills, he also frequently gets stripped or throws the ball away when pressured. He has trouble shooting through contact or in traffic and is often unable to finish after offensive rebounds or passes to him in the paint. He is slow, which hinders him in transition. While his post defense is good, he is not quick enough to stay in front of guards and is almost hopeless when he is forced to switch onto quick players. Outlook: To become a go-to player at the college level, Wiltjer first must improve his strength, speed, and quickness. He needs to get more comfortable with contact in the paint and with handling defensive pressure, which I think will likely come with practice and playing experience. While Wiltjer’s YouTube videos suggest he is a goofy and lovable guy, which I think is awesome, he needs to get meaner on the court. Wiltjer committed to Kentucky so he could play with elite talent and push himself, so I believe he’ll be up for the challenge. Looking forward to the NBA, I can see Wiltjer fulfilling a role similar to Matt Bonner’s. Teague is the latest of Calipari’s string of highly touted freshman point guards and the younger brother of Atlanta Hawk Jeff Teague. He hasn’t been as outstanding as the other Calipari point guards in his first year at college, but he plays a major role on the team. Strengths: Teague’s greatest asset is his speed and quickness. He can dribble past defenders seemingly at will and is excellent at getting to the basket. He is quite good at handling full court pressure and can often break presses by himself. Teague is an unselfish player who looks to set up and create for his teammates. He’s an above average rebounder for his position, sometimes using his athleticism to rebound in traffic or over much larger players. He’s also good at creating shots for himself in isolation sets, using crossovers and hesitation moves to create separation from defenders, which is a valuable asset when the shot clock is winding down. Weaknesses: Teague is fairly inconsistent at this stage and can get flustered when things aren’t going well for the team. When he is off, he is prone to forcing long jumpshots and making bad passes. He also has a habit of sometimes jumping and picking up his dribble before he knows whether he’s going to pass or shoot, which results in turnovers. He doesn’t have outstanding passing skills or court vision yet. Defensively, he occasionally shows a lack of pride or interest in giving it his all. He is only an adequate jumpshooter for now, although he’s had success with pullup midrange jumpshots. He also isn’t great at finishing at the rim, lacking a gentle touch after his blazing drives to the basket, which causes him to miss too many layups. Outlook: Teague has a lot of the tools that make a successful NBA point guard, but his game isn’t all the way there yet. He’s developed and matured noticeably in his one season at Kentucky, and another year or two of growth like that would make him a good starter in the NBA. His ability to create shots and plays on his own is especially valuable at the professional level, and he’s shown himself to be able to fulfill a point guard’s role on a squad of NBA talents. Lamb is an extremely skilled and fluid offensive player. He came off the bench in his first year at Kentucky but now starts in his second. In my opinion, he’s the most dangerous and efficient scorer on this year’s team. Strengths: Lamb, above all, is an elite shooter. He has a quick release and shoots threes and midrange jumpshots at a very high percentage. He’s routinely one of the best free throw shooters in the SEC. He can also score off of the dribble, putting excellent touch on both layups and midrange floaters. He is a graceful ballhandler, and is more than capable of being the primary ball handler on the court. His movements are smooth and under control seemingly at all times, and he displays a general knack for putting the ball in the hoop. Weaknesses: Lamb does not look to create for teammates very often. He does not stand out defensively. He doesn’t display great athleticism – I don’t think I’ve ever seen him choose to dunk in a game even on breakaways. He’s also not always as aggressive as he should be given his tremendous offensive skills, and sometimes forgets to attack the basket or create shots for himself. Outlook: I expect Lamb to transition his game seamlessly to the NBA. His shooting proficiency and touch are undeniable, and with his quick release and high arcing floaters he’ll be able to get his shot off even against larger and more athletic NBA defenders. Lamb may need to improve his defense somewhat to keep up with the NBA game, however. If Lamb becomes more assertive with his shot, I can see him scoring 15+ points per game in the NBA in a Kevin Martin-type role. I can also see him as an offensive spark off the bench similar to Jason Terry. Kidd-Gilchrist (or as I sometimes affectionately call him, Gillie the Kidd) was considered by many to be the best high school player in the country as a junior. He’s young for his class, enrolling in college as a 17 year old. As a freshman, he’s been a leader for the team emotionally as well as in the gym. He started a “breakfast club” in which he and some teammates would wake up early to go to the gym and eat breakfast together. He’s lived up to lofty expectations at Kentucky, having been named an All-American by several news outlets. Strengths: Kidd-Gilchrist is a very well-rounded and talented basketball player, but where he truly stands out is inwhat most call “intangibles.” He has a legendary work ethic, motor, and competitive spirit. He plays defense with pride and vigor and is possibly the most aggressive player I’ve ever seen on offense and in transition. He’s humble and has no ego, recently volunteering to give his starting spot to Darius Miller in the SEC tournament. In terms of his skills, Kidd-Gilchrist is a ferocious rebounder and scorer in the paint. He is great at operating in traffic and finishing through contact. He can take defenders off the dribble and has excellent touch at the rim. He is comfortable posting up, and perhaps Kentucky’s most reliable offensive option this season is Kidd-Gilchrist posting up and shooting over smaller defenders in the paint. He is also an adept interior passer, frequently dumping the ball to teammates for higher percentage shots in the paint. Kidd-Gilchrist is outstanding in transition, and can push the ball himself at a high tempo or run the floor and finish with exceptional athleticism. Defensively, Kidd-Gilchrist is elite. He has good size and length, quick feet, and endless energy. He rarely gets beat and frequently makes spectacular blocks and steals. Weaknesses: Kidd-Gilchrist is almost predictable with how aggressive he is and how often he takes the ball to the basket, and defenders in college have taken advantage of this by sliding in front of him and drawing charges. It is practically a given that he will get called for at least one charge every game. Kidd-Gilchrist’s jumpshot also leaves a lot to be desired at this point, and his release is a bit slow and unorthodox. Outlook: Kidd-Gilchrist is a projected high lottery pick in the NBA, although he has said he will return to Kentucky after this season is over. Whenever he goes to the NBA, I believe Kidd-Gilchrist will be a franchise player. He has the work ethic, determination, and physical tools of a superstar. He is only 18, so there’s plenty of room for him to get even stronger and more polished. I have little doubt that he will develop a solid jumpshot in the NBA – at college he’s much more useful shooting from the paint but he will certainly work to adapt. Also, the NBA has rules that are friendlier to offensive players than in college which means Kidd-Gilchrist will be less susceptible to committing offensive fouls and will have more ways to score. 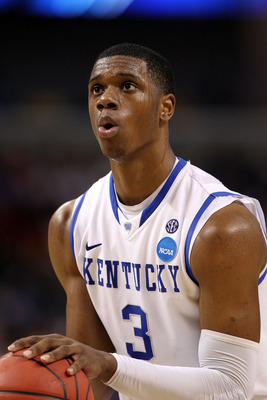 Terrence Jones surprised onlookers by returning to Kentucky for his sophomore season. Considered a preseason contender for Player of the Year, Jones’ second season hasn’t quite lived up to those gaudy expectations and has had some bumps in the road. Nevertheless, Jones is a key player on this team and shoulders a large portion of the rebounding and scoring load. Strengths: Jones is a strong and athletic forward with good size. He’s a proficient dribbler and can take defenders off the bounce, making him a substantial matchup problem for slower post players. He’s at his best when he uses his exceptional strength and athleticism to finish drives and post moves with dunks or layups at the rim. He has a respectable jumpshot and is capable of knocking down threes when left open. He comes alive in transition, where he’s extremely capable either pushing the ball himself and making nifty passes or finishing with dunks. He’s an outstanding defensive rebounder, frequently snatching rebounds in traffic or away from opponents. He’s not as active rebounding on the offensive end, but he does often follow up missed shots with putback dunks. Defensively, he frequently uses his strength and length to make shots difficult for opponents and is an excellent shot blocker, rising to swat away shots without fouling too often. Weaknesses: Jones’ most glaring weakness is his inconsistency and tendency to get thrown off his game during rough patches. When Jones gets frustrated, he is a completely different player. He is prone to forcing long, out of rhythm jumpshots. He gets tunnel vision offensively and dribbles into double teams creating turnovers or bad shots. At his worst, he also seems to lose interest defensively and displays bad body language on the court. Several times during his two years at Kentucky, Jones has had stretches where he plays poorly as described here for the better part of a game, but then looks like an All-American over the next couple of weeks. Aside from this inconsistency, Jones’ touch around five feet out leaves something to be desired. He’s not exceptionally accurate with hook shots from around that distance or when he’s stopped short of getting all the way to the rim on a drive. Jones can also stand to improve his free throw shooting considering how often he gets to the line, and he should continue to work on his jumpshot if he wants to be a shooting threat in the NBA. Outlook: Jones needs to convince NBA scouts and coaches that he’s matured and in control of himself. Earlier this season when Jones was playing poorly, it looked like he’d cost himself a spot in the lottery. However, he’s been in top form for the past few weeks, so I’m holding out hope that he’s matured for good. If Jones remains determined both on and off the court, I think he will likely have a promising and exciting career in the NBA as a forward, possibly something in the mold of Shawn Marion. 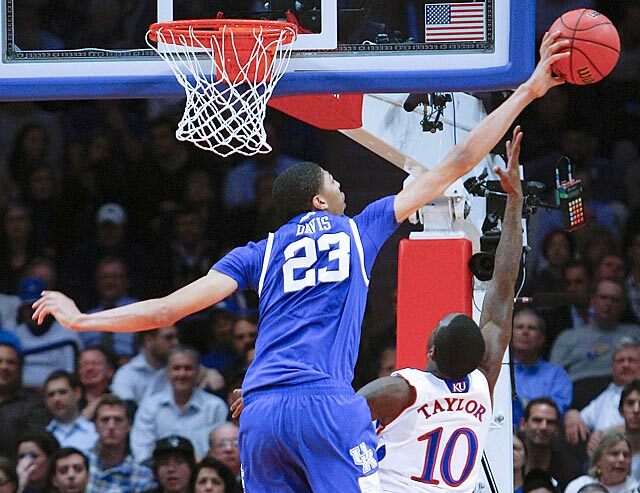 Anthony Davis is considered by most to be this season’s National Player of the Year. It’s well known that he used to be a guard in high school before undergoing a massive growth spurt which has allowed him to dominate the paint this season and break numerous shot blocking records. He’s also singlehandedly made unibrows cool again. Strengths: Davis is best known for his defense. As a shot blocker, he uses his tremendous length and athleticism to swat away or alter countless shots. He has great shot blocking instincts, rarely fouling and frequently blocking shots in such a way that he or a teammate gains possession. He plays smart, positioning himself and rotating well to respond to the offense and deliberately avoiding fouling when he is in foul trouble. He has a fantastic motor and great speed which allows him to cover large areas of the court. He also has good hands and anticipation, allowing him to frequently strip defenders and intercept passes. He is a great rebounder and can secure missed shots in his grasp high in the air. Offensively, Davis is a smooth and skilled scorer. He has fantastic touch around the basket and a knack for laying the ball softly off the backboard. He can take defenders off the dribble and get to the basket in only a few strides. He’s also displayed a few nifty post moves, using spins and drop steps to get past post defenders. He has a nice-looking jumpshot and shoots a respectable percentage from the free throw line. His best offensive move, however, is dunking lob passes thrown to him by teammates from a height that defenders simply can’t reach. At 6’10 with a ridiculous wingspan, Davis seems like a natural athlete with excellent coordination which is very rare for players his size. Furthermore, Davis displays a great competitive spirit and level of determination. He plays without an ego or attitude despite all the hype surrounding him. Weaknesses: Davis is fairly skinny, and this occasionally causes him to lose the battle for positioning against stronger post players. His jumpshot hasn’t been particularly accurate this season for Kentucky. On the perimeter, Davis seems to prefer shooting jumpshots, but since he frequently has a great speed and athleticism advantage against other post players that would make driving to the basket a more efficient choice. Outlook: Davis will very likely be the first overall pick in the upcoming NBA Draft and for good reason. I expect Davis to be a star right away and I think he has a good chance of being an elite player and capturing several Defensive Player of the Year titles. He has an extremely rare package of physical tools, skills, and intangibles, and does things on the court that few others can. And, having just turned 19, he’s far from reaching his ceiling. Now that it’s time for the 2012 NCAA tournament, I will be writing a few posts about college basketball. I think the NCAA men’s basketball tournament is the greatest sporting event of the year by far in many ways. But that’s not what this post is about. This post is about shot selection – specifically when it is a good decision to shoot a three point jumpshot. It can be a difficult decision to make, and it’s one that I feel players often get wrong. In general, taking a bad shot means that the possession ends with a lower percentage shot than the team would expect to have later in that possession. Passing up a good shot means that the team will likely have to settle for a lower percentage shot or possibly turn the ball over. Not all players are faced with a tough decision. For elite shooters, the decision is easy. They try to get open from three point range and, whenever they do, they shoot without hesitation. Their role on the team is to shoot threes and everyone expects them to shoot when they get a clean look. They shoot at a high enough percentage that almost any uncontested shot is expected to result in significantly more points than an average possession for that team. For non-shooting post players, the decision is even easier. They rarely try to touch the ball on the perimeter and they know not to shoot threes unless the shot or game clock is extremely low. Life is easy, just eat bamboo and don't shoot any long jumpshots. In the Omnivore’s Dilemma, Michael Pollan discusses how omnivores are faced with the tough decision of choosing what to eat. Omnivores can – and often must – eat a variety of foods, but it is not hardwired in them to distinguish foods that are good for them from foods that are bad or even toxic. Animals in the wild that eat only one thing don’t have this problem. 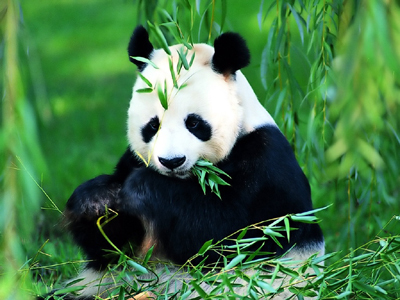 Pandas know bamboo will properly nourish them and not make them sick, just as cows do with grass and lions do with hoofed mammals. In basketball, average three point shooters are the omnivores. Sometimes it is good for them to shoot, but sometimes it is bad. If they habitually decline to shoot, they neglect a potentially productive area of their game and allow defenders to sag off them to contain dribble penetration. If they shoot too much, they wind up wasting possessions on suboptimal shots. When players take shots that are considered bad, they may be chided by the coach or lambasted by fans and media for being trigger happy. When players pass up shots that are considered good, they may be chided by the coach or lambasted by fans and media for being passive or timid. To shoot? Or not to shoot? How good is he at shooting threes? How open is he? A wide open shot is preferable because it can’t possibly be altered and allows time to set up like the shooter would in practice. How much time is on the shot clock? More time means there are more opportunities to get a better shot. A shot that’s good with 10 seconds on the shot clock might not be good with 25 seconds left. How efficient is his team on offense against the opposing team’s defense? A team with a superior offense should be more selective, whereas a team that’s overmatched should have lower standards on their jumpshots. Is his team behind? A team that’s behind by a lot should be more inclined to shoot threes as those increase variance in the game and make comebacks more likely. What kind of rebounding position are his teammates in? When the paint is devoid of teammates, the chance of an offensive rebound is slim and the shot is less desirable. That is a lot to take into consideration. Players usually have a window of less than a second to decide whether to shoot before a defender gets to them, making their decision even harder. On top of that, I believe confidence to be an important asset for a shooter to have. Second guessing oneself on a shot can only decrease accuracy. Players just don’t have the luxury to process everything or doubt themselves in the heat of the moment. If you take a three point shot and move it closer to the basket by a foot or two, you get a long two. Long twos are the shots that are 85%-99% as difficult to make as three point shots but are worth only 67% of the points; every player would be wise to avoid them. Yet, players shoot long twos anyway and the ones that I’ve found most prone to doing so are average shooters. I think average shooters may do this to avoid the criticism and mental anguish that can come with shooting (and missing) a potentially ill-advised three point attempt. Or maybe they’re more likely to put themselves in position to shoot long twos because they are not concerned with shooting threes. On the other hand, elite shooters attempt threes with a purpose and make a point to ensure that all their long jumpshots are threes. Even though a three and a long two are essentially the same in every way except for how many points they’re worth, they get treated very differently by media and fans. In the box score, threes are their own category while long twos are grouped together with all other shots including layups and dunks. Fans and commentators love box scores because it’s easy and deemed acceptable to draw conclusions based on them alone. If Average Shooter X, who averages two 3PA a game and shoots 35% for a season, goes 1-7 from three point range in a loss, that figure will stick out like a sore thumb in the box score. I mean, what was he thinking missing six threes in a game? One factor that is not on my list of what determines a good shot above is how many threes that player or his team have already made or attempted that game. Very often you’ll hear basketball commentators on TV saying a certain team needs to make x amount of threes to win an upcoming game. Or you’ll hear them blame a loss on a team or player attempting too many threes when they have taken more 3PA than average. Comments like these are often misguided. As Ken Pomeroy showed in his blog, defenses have a significant amount of influence over how many three point attempts they allow but very little influence over what percent of those attempts go in. This reinforces the idea that there is a lot of randomness involved in whether three point shots go in or not. More importantly, this data supports the theory that a team that’s committed to and/or effective at defending three point shots can reduce the amount of clean three point looks the other team gets and consequently reduces the number of shots they attempt. 28 is a big number. 6 is a small number. Time to draw conclusions. 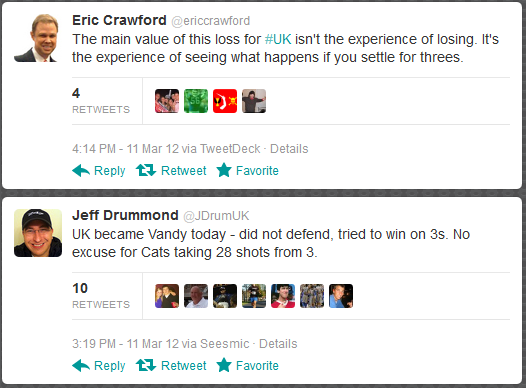 The tweets above came from media members after Kentucky’s recent 71-64 loss to Vanderbilt in the SEC championship game. Kentucky this season is widely considered one of the best teams in the nation at defense, two point shooting, rebounding, and getting to the free throw line. In this game, Vanderbilt had better offensive and defensive rebounding percentages, attempted 13 more free throws, and shot higher two point, three point, and free throw percentages than Kentucky. Oh, and Kentucky went 6-28 from three point range. You can see which statistic the media decided to make a narrative out of. I watched the game closely and I did not notice any appreciable difference in the quality of three point shots Kentucky attempted compared to their other games. Most were open looks and most were taken by their best three point shooters. In fact, the shot selection and distribution was quite similar in Kentucky’s 79-49 victory over Georgia a few weeks earlier when they shot 15-27 from three point range. Of course, nobody after that game was lamenting that 27 threes is too many or that Kentucky’s players needed a lesson to teach them to shoot fewer threes. The difference between shooting 15-27 and 5-27 is 30 points, the margin of victory that game. But what is there that can be learned from all this? In general, I think players should pass up shots more often early in the shot clock but hardly ever pass up decent looks late in the possession. I think time on the shot clock is an important factor in determining shot selection yet it seems to be one that is often overlooked. With lots of time left, teams should be working to get a high percentage shot, preferably a layup or a dunk. Those seconds are valuable, and when a team shoots they forever lose what is left on the clock. Yet when the shot clock hits single digits, “beggars can’t be choosers” applies. A shot clock violation or a desperate or forced shot are vastly inferior outcomes compared to any reasonable shot attempt that comes in the flow of the offense. As Matt Goldman shows in his study on NBA decision making, the value of holding on to the ball declines gradually for most of the possession and then dips sharply in the final five seconds of the shot clock. Having to create a shot that late is no easy task. I also think it would be beneficial for players and coaches to discuss what kind of shot selection and three point shooting thresholds would be optimal. This would reduce the amount of thinking about whether or not to shoot that is required during games. And, when a player does decide to shoot, he should shoot with a purpose and with complete confidence… and pay no concern to what negative things people might say on Twitter.